Alumni Gretel And Her Girls! We adopted Gretel in October of 2012. She is a wonderful girl. Many people will remember that she was in pretty bad shape when she first arrived to GSROC. We are thankful that Gretel was taken care of by your organization. We can’t imagine our home or our lives without her. We had her hip corrected with some surgery last month. We are an active family and we wanted Gretel to be ready for more hikes, more camping, and more fun. The hip is recovering beautifully. 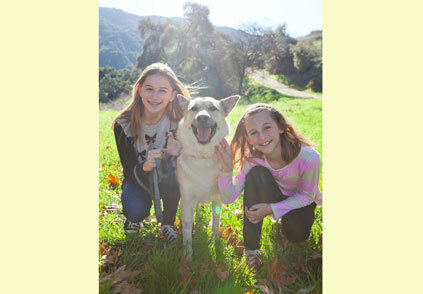 Gretel is a love and we are so appreciative of GSROC for rescuing her. She is shown in this photo with our daughters. Gretel is smiling too!